Fleet vehicle wraps are great to increase brand exposure! If you are the owner of a small business, no matter what it is, you understand how important advertising is. Let’s face it: there are a lot of companies out there, so it is really easy for your business to get lost in the sea of competition. You need to invest in innovative and unique advertising that will set your company apart from the others so that you will come out on top. Vehicle wraps are a great way to advertise whatever you do in a big, bold, colorful way. Fleet vehicle wraps are large vinyl graphics or decals that are applied to the outside of your fleet vehicle. Chances are, your company already owns vehicles. Why not use them for advertisement? If you already have them, wrapping your vehicles is a super cost effective way to get the word out about your business. At the very least, you can get them branded with the company logo. Every day, hundreds of people see your vehicles on the road. By wrapping your fleet vehicle, you can advertise to an array of drivers on those longer road trips! 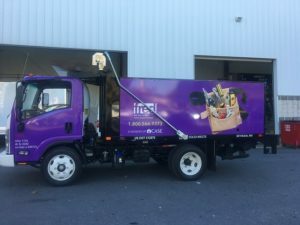 Another great reason to choose fleet vehicle wraps is so that you do not have to invest large amount of money into advertising or billboard space. It is estimated that one vehicle wrap can make between 30 and 70 thousand impressions, offering the lowest cost per impression rate of any type of advertising. They are also one of the most effective ways to advertise offline nowadays. Okay, so you have decided to go ahead and purchase some wraps, now what? It usually takes about four days to print and laminate the graphics for car wraps, so in the meantime, prepare your vehicles. Hours before your vehicle is to be wrapped, be sure to use brushes or a pressure washer to remove dirt and grime from all over, including low-lying parts, inside door panels, and everywhere else dirt can accumulate. Ensure that all wax, polish, and grease is also removed from the vehicle, as it can interfere with the adhesive. Questions? Call Brand It Wrap It! Whether you are ready to buy your fleet wraps or you still have more questions, Brand It Wrap It is here to help you. We are a full-service sign and wrap company that is dedicated to providing high quality signage to all of our customers in Rockville, Maryland, Virginia, and the greater DC metropolitan area. For tips, tricks, and to see what we have been up to, be sure to follow us on Facebook, Twitter, Google+, and Pinterest! This entry was posted on Friday, November 30th, 2018 at 10:28 pm. Both comments and pings are currently closed.